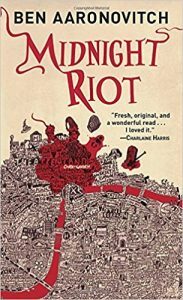 Midnight Riot by Ben Aaronovitch | Blah! Peter Grant, the son of a British musician and an African immigrant, is a novice constable in London, about to get his first assignment. Not having shown any particular aptitude, he is resigned to a menial desk job. That is, until, while on the scene of a murder, he ends up talking with a ghost. This opens a whole new reality for him, and his colleagues, in which ghosts and river gods inhabit the shadows of London, pushing and pulling at the fabric of regular London society. Peter is found by a true magician, Thomas Nightingale, who is the lead, and only member, of a special police division charged with investigating supernatural occurances. Together, they investigate a series of murders that seem to be connected to some pissed off ghost. At the same time, they have to prevent factions of different river gods and goddesses from warring with one another. Along the way, Peter begins his journey to become a magician in his own right. Set in modern London, Midnight Riot by Ben Aaronovitch has a style that brings London to life, with both casual but familiar descriptions of various parts of the city. Aaronovitch also does an adept job of balancing a world in which magic and science coincide. One of the interesting threads is how Peter applies his more scientific view of the world to his discovery and understanding of the magical side of reality. Though, there are a few things that are a stretch. At one point, Peter looks at a pulverized circuit board under a microscope and determines it contained silicon and a few impurities. In reality, it would take the most powerful electron microscopes and significant analysis to determine something like this. No regular optical microscope could do it. I hesitated to read this book only because it is the first in a relatively long series, something like 6 or 8 books. However, this was both an entertaining and relatively easy read with reasonably intelligent and surprising plot twists to keep the plot moving along. The world that Aaronovitch has created is full of energy and intelligence, enough so that I am tempted to keep on following the adventures of Constable Peter Grant.